Germany was a total dictatorship under the Nazi Party and Chancellor Adolf Hitler (pictured below right) in 1938. The Treaty of Versailles effectively ended World War I in 1919 and had imposed strict disarmament terms on Germany. However, by the late 1930’s, Hitler had dropped all pretense of observing the terms of the treaty and began not only to rebuild Germany’s military but also to speak openly of Germany’s need for lebensraum , or ‘living space’. In March 1938, Nazi troops took control of Austria with little justification. Austria put up no resistance and Hitler claimed that the annexation was supported by his doctrine of Anschluss, or natural political unification of Germany and Austria. Although gravely disturbed, Britain and France took no action. Shortly after, Hitler demanded that Czechoslovakia hand over to Germany the Sudetenland, a territory along the German-Czech border. 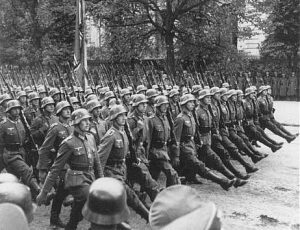 Hitler accused the Czechs of repressing the large German population there and claimed that the territory rightly belonged to Germany. The Munich Conference was called in September 1938 to address the situation; ironically, Czechoslovakia was not present. After several rounds of negotiation, and despite their own treaties with Czechoslovakia, Britain and France agreed to give in to Hitler’s demand if he agreed not to seize any further European territory to which Hitler signed an agreement to that effect. This agreement promised no further invasions. (Pictured left: Neville Chamberlain on his return from Munich after meeting with Hitler, making his “peace in our time” address). However, after taking the Sudetenland, Hitler ignored the agreement and proceeded to occupy most of western Czechoslovakia along with several other territories in eastern Europe. Britain and France again stood back and took no action. 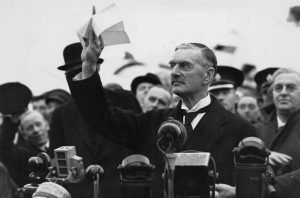 This policy of appeasement of Hitler’s demands, which was advocated primarily by British Prime Minister Neville Chamberlain, has been much criticised as paving the road to World War II. The decisions that were made by the Allied nations leading up to World War II, as well as those of the first six months or so after the war began, have dumbfounded historians ever since. The appeasement of Hitler, in particular, has been so often held up as an example of how not to deal with a rising dictator that it has become a stereotype. However, although it may be obvious in hindsight that Hitler should not have been appeased, the actions of Prime Minister Chamberlain must be considered within the context of the time as Europe was still recovering from World War I and many of the countries of Europe were adjusting to new parliamentary governments, and the newly created League of Nations was a new force in international affairs. 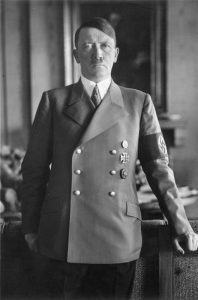 Few European leaders understood the full scope of Hitler’s intentions, and a decision to go to war would have been hugely unpopular in countries, such as Britain and France who were so devastated in World War I. Indeed, many sincerely believed that the very concept of war had become obsolete. On 23 August 1939, a fateful meeting occurred in Moscow between German foreign minister Joachim von Ribbentrop and Soviet foreign minister Vyacheslav Molotov. They announced publicly that Germany and the USSR had signed the German-Soviet Nonaggression Pact to prevent hostilities between their two countries. However, the ministers kept secret the fact that, in addition to agreeing not to attack each other they would however overrun the countries that lay between them. Specifically, they agreed that Germany and the USSR would each take over one half of Poland, with a further provision that the USSR would take over Lithuania, Latvia, and Estonia without any interference from Germany. The German invasion of Poland came quickly. The attack began on 1 September 1939, with heavy air strikes followed by a rapidly advancing ground invasion. Hitler referred to this strategy as blitzkrieg, or ‘lightning war’. The object of the blitzkrieg was to shock the opponent so severely that there would offer little resistance and thus allow the country to be overrun quickly and with minimal German losses. The primary obstacle to the German invasion force proved to be the Polish capital of Warsaw. This city did not surrender until 27 September and only after a prolonged siege. By this time, western Poland was firmly under German control. Although the invasion of Poland is cited as the definitive example of the blitzkrieg tactic the Geramns did not rush to Warsaw to topple the government. Germany’s forces moved relatively slowly, focusing on targets that were neither military nor political in nature. They sought not only to destroy the Polish government but also the Polish people. In the first days and weeks of the war, both Jewish and non-Jewish civilians were killed regardless of whether they resisted. Villages and towns were burned, and fleeing survivors were ruthlessly chased down and shot. It was in this invasion that the real nature of Hitler’s plan began to reveal itself. Although the regular German army, the Wehrmacht, defeated the Polish military within days of the invasion, a more sinister set of squadrons followed, the Totenkopf, or ‘Death’s Head’, part of the soon-to-be-infamous S.S. These squadrons began rounding up and killing Polish civilians. Larger groups of Jews were singled out and herded into the central Warsaw ghetto where they were slowly starved for the next two years. Smaller groups encountered along the way were shot on the spot. Although Jews were particularly singled out, the non-Jewish Polish peasantry was treated little better. Though these atrocities would pale in comparison with what was to come, the initial weeks of Hitler’s invasion were a gruesome demonstration of the German war machine’s capabilities and intentions. Two weeks after the German invasion began, Soviet troops invaded Poland from the east on 17 September. It took them two days to push far enough to meet German troops advancing from the west. By this time, Germany had already taken most of Poland except for Warsaw, which was under siege. Upon meeting the Russian troops, large numbers of prisoners were handed over before they withdrew to an agreed line. The retreating Polish armies, unaware that the USSR was part of Germany’s occupation plan, fled directly into Russian hands. Britain and France were soon labelled the Allied Powers, just as they had been in World War 1. Both declared war on Germany on 3 September 1939, just two days after Germany began its invasion of Poland. However, aside from basic defensive preparations, neither country took significant action for several months. Britain initiated a propaganda effort against Hitler by using its bombers to drop millions of anti-Nazi leaflets over Germany. This became known by the British people as the ‘confetti war’. Germany likewise took little action after the invasion of Poland was complete, aside from some naval attacks on Allied shipping. This period of relative calm has been sarcastically labeled the ‘Sitzkrieg’, or sitting war, a play on blitzkrieg. Rather than make an offensive move of their own, the Allies waited for the expected German attack on Belgium and France. This would not come until the late spring of 1940. This period was referred to in Britain as the ‘Phoney War’. The one active hot spot during this ‘Sitzkrieg’ was Finland, which the USSR invaded in November with the goal of seizing the eastern Finnish territory of Karelia. Vastly outnumbered and outgunned, the Finns fought back with determination and innovation, even employing troops on bicycles and skis. The invasion, which was expected to end quickly, instead lasted until 13 March 1940 when Finland finally capitulated, ceding Karelia to the Soviet Union, along with the major port of Viipuri (present-day Vyborg). Although Finland lost territory, the victory cost the USSR more than 200,000 lives, more than twice the number that it cost the Finns. After months of inaction, the first sign that Hitler was again on the move came in early April 1940. On 9 April, German troops simultaneously took Copenhagen, the capital of Denmark, and landed on the coast of Norway. Denmark gave in almost immediately. In Norway, although the capital at Oslo was quickly taken and a puppet government set up, a strong resistance movement supported by Britain and France continued to fight the Germans for two months. The combat was generally limited to the less densely populated areas in the north of the country. 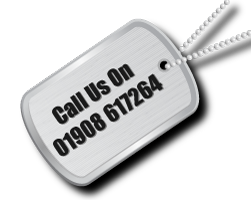 For more details of our World War 2 battlefield tours, call us on 01908 617264.